This lovely family home is set on a 2,000 m2 erf, and located a short drive from Louis Leipoldt Primary, Centurion High, and numerous day-care and pre-school centers. 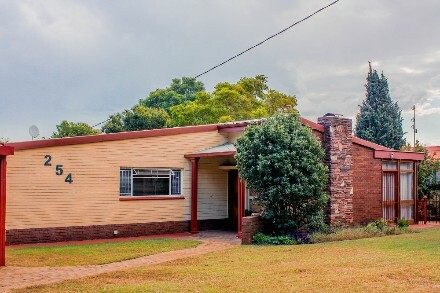 Well-loved and well-cared-for, this three-bedroom family dwelling is in pristine condition. A light and bright entrance hall leads to a large, sun-drenched lounge and spacious family room on your left, which in turn opens onto a covered patio. To your right, a generous dining room leads to a neat, fitted kitchen, boasting ample cupboard space and plenty of working surfaces. Down the passage you will find a study, three bedrooms with built-in cupboards, and two bathrooms, of which the main is en-suite. The master bedroom in particular is generously endowed with built-in cupboards, as well as a walk-in wardrobe. Additional features of this superb home include a double garage, separate laundry, and an extra store-room. For the security-conscious, an alarm, electric fence and motorized gate take care of your safety needs, with more off-street parking available for your guests. The back yard is large enough to add a swimming pool, a lapa, or even a granny flat – the possibilities are endless, so come and see for yourself before it is too late! Centurion Mall, the Gautrain station, Unitas hospital, and major highways are all within easy reach. This great find will not be on the market for long, so call today to book a private viewing.